I am planning on having an aisle runner because I don't like the carpet too much at the venue. It was the only thing about the place that I wasn't in love with and I'm trying to go for an all white look with the decorations (the carpet is green!). So my questions are, is it completely unacceptable to have the aisle runner out before and as guests arrive? Or is that one of the older traditions that I can not worry about? I know of the trick to rope off the aisle so that it can be down ahead of time but prevent people from walking on it, however, the way the venue is, people will need to cross the aisle to get to the other side of the room. If it's a big no-no to have the aisle runner out, then who should I have roll it out before the processional? I don't have ushers. Thanks in advance and my apologies for any lack of knowledge I have about the aisle runner! The trick with aisle runners is that they will get messy look very quickly. As people step on it, wrinkles will develop and it may get dirty (being white). If you are married to the idea of the runner, it should be rolled out just before you enter. Perhaps there are individuals from the venue that could roll it out? Keep in mind that it is also a trip hazard and I have actually seen a bride do a face plant because she tripped on her runner. The green carpet may not be aesthetically pleasing, but likely won't even be noticed by you or your guests. We got married in front of a wine wall and I wanted it to be flushed out with wine for pictures. You don't even notice the wine at all so it was really a waste of my time and energy wanting and making that happen. Do you have any other ideas for alternatives to an aisle runner that may cover the carpet? I really feel you're overthinking this. Are you honestly going to be looking at the carpet in your pictures or at the smiling faces of your family, friends, and yourself? I can guarantee no one else will even notice the carpet (what color was it at the last three weddings you went to? ), and if you don't insist on focusing on it, I expect you won't either. When I look at my pictures, I only see the people. I had to purposely look to see the details around. This is not something that will matter in the long run. If the carpet is that bad then print those photos in black and white. Is your photog good at Photoshop? What do you not like about the carpet? My FI uses Photoshop for work and could change the color of the carpet in about 10 seconds. Maybe that's an option? I see that this is an unpopular opinion, but, I also hated the carpet at our venue, and it did matter to me. I used an aisle runner that was laid out prior to any guests arriving. We didn't have any problems and it held up fine. I think green, purple and white go together, not clash. That being said, I really wouldn't worry about the carpet color. I'm anti-runner. I've seen a few that look nice. More often times it looks like putting lipstick on a pig. If you have the money then go for it, but I would not waste my money on an item I literally walk up and then back down again. Green grass isn't quite the same as green carpet. Here is a picture of someone else's wedding at the same venue. I think the green on this carpet really stands out. I'm putting candles in hurricane vases down the aisle and they have a mix of white and purple candles in them as well as putting white and purple flower petals scattered to frame the aisle. I just feel like it will look strange with the carpet. At this point, I'm trusting all of you that the carpet will really not be a big deal and I'm not getting an aisle runner. I just wanted to show you what I meant. I certainly didn't mean to imply that anyone who had some green in their wedding didn't choose great colors! We all know that each of us have different preferences. @lyndausvi Those dresses are absolutely beautiful! Lovely photo. I think the carpet color a venue is the very definition of first world problems. Worry about food, booze, your vows, your FI, your guests' comfort. If you are looking at the color of the carpet instead of your FI you are doing something wrong. If you think the color of your carpet is going to overpower your photos I think you are wrong. An empty room is going to make the carpet stand out. Once you get guests in the chairs, WP and FI at the end. It will be barely noticeable. This is coming from someone who had to move her wedding from a beach to a concrete slab under a tent because of a tropical storm. Did I notice the concrete slab in the pics? Yes I did. Did it ruin the picture? Nope, not at all. This is coming from someone who had to move her wedding from a beach to a concrete slap under a tent because of a tropical storm. Did I notice the concrete slap in the pics? Yes I did. Did it ruin the picture? Nope, not at all. Oh please! This is so sanctimonious. There is zero indication she is failing to consider her guests' comfort or be a good host- she just also wants ideas for how to not have a hideous carpet in her photos. They aren't mutually exclusive. I don't think we have one picture of guests entering the church. Church pictures typically begin once the bridal party/parents begin to process. I would place the aisle runner down at the typical time. I also think there is a huge difference between a natural grass floor and a green carpet. The contrast in your picture is very stark and I have to agree that the carpet does indeed stand out. However, there is really nothing else in the picture to distract the eye. 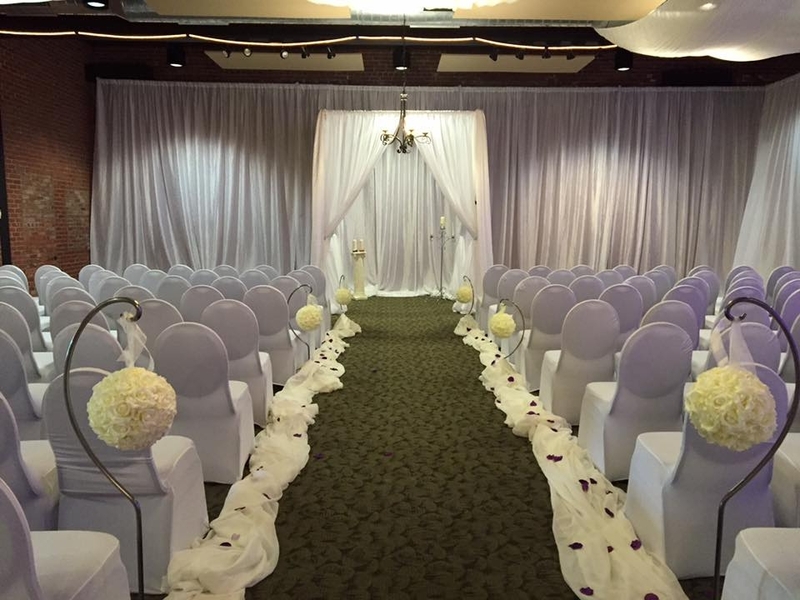 Once your ceremony space is filled with guests, the contrast won't look as severe. Save the aisle runner for the start of the ceremony. I was going to say... purple and green are complimentary colours, but I do agree that the carpet in your venue is quite bold. Interesting the venue chose that carpet over a neutral. We had an aisle runner in our ceremony- I can't remember if it was red or white- it was provided by the venue, so I said sure, but I doubt I'd pay for one. FWIW, we had no issues with the aisle runner- in fact I don't even remember it! But I can say I didn't notice a change in surface walking onto the runner, guests walked up and down it, no ruffles, no trips. Any sort of "rug" (whether we're talking wedding venue or your house) is a tripping risk- so make sure it's going to be put down and secured properly. Again, I doubt I'd pay for an aisle runner myself, and I doubt you'll notice the carpet the day of, but if it really bothers you and you have the money to get an aisle runner- go for it. P.S. I would have the aisle runner put down and secured well before any guests arrive. Do not roll it out- that seems like unnecessary fan fare- you want it to cover up the carpet, not because *only* the bridal party can walk on it. And as said, to alleviate tripping issue or ruffling of the runner, it should be well secured. I see both sides of this. On the one hand, it's superficial and silly to worry about something that is 100% frivolous. A runner is fussy and adds expense for no particular useful purpose. In fact, it has the negative effect of making it more difficult to walk down the aisle. But on the other hand, the frivolousness argument could be made about the vast majority of things involved in wedding planning. Flowers are frivolous. A big, expensive dress is frivolous. Programs and favors and flower girls and rings are frivolous. You don't need any of that stuff to get married. If you hate the carpet and you have money to throw at the problem that wouldn't be better used for a different purpose, there is nothing wrong with doing a runner. I wouldn't spend money on one but that doesn't mean you shouldn't. I appreciate the advice from all of you! Thanks so much. I'll just leave it for now and if I have the money a month out or so, I'll get a good one. Just another thought, re: that picture. Are you likely to print/display such a photo? When there is literally anything else in-frame to look at, the carpet will be essentially invisible. It's only noticeable there because it's centered in the shot with nothing else more interesting to draw the eye.